I totally understand why Marvel is rebooting their books, again. I mean I should be excited for World War Hulk II, but the story is dragging itself out. It’s Greg Pak’s excuse to discover Cho’s inner child, which happens to be the Hulk. Now strangely enough, this Hulk is an intelligent Hulk with little motivation but to control and blame everything that’s happened in the Marvel Universe as of late. One of the prime example was Captain Marvel’s covering for Hawkeye because he put Banner down. Alpha Flight also gets the brunt of Hulk’s wrath as well. They failed to keep Prince Phalkan locked up for good. I didn’t enjoy the change of artists either. Lorenzana’s artwork seems so generic that it comes off like one of Marvel’s kiddie titles. The previous World War Hulk had a much bigger scale and gave us more reason to fear the Hulk losing it. The end of the book has an ad for Immortal Hulk with Bruce Banner. It could be the reason the title hasn’t kept up the quality. The next issue will conclude the story line, so I might stay on board. 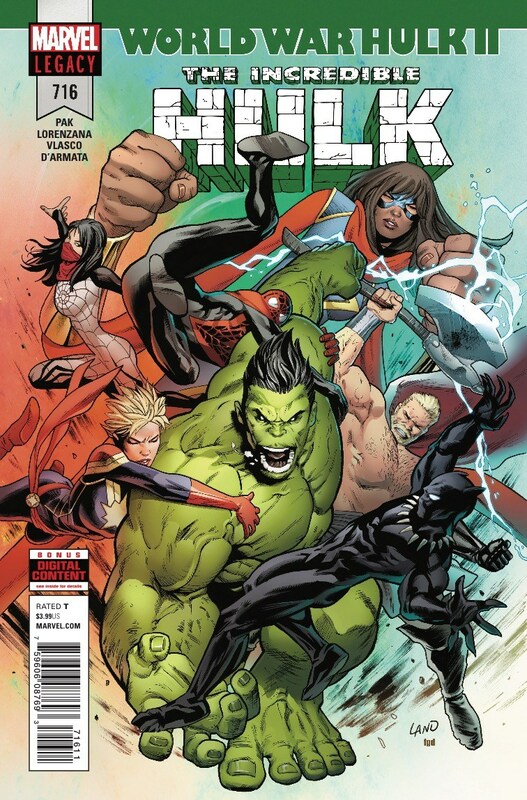 I’ve been a Hulk fan for long time and I continue to hope for the best, even if it isn’t at its strongest right now.